The equation changes with the appearance of the human being. At a certain optimal point in the refinement of consciousness, the human being becomes secretly conscious of the all-embracing infinity that is the source of all manifestation. There now develops a yearning for a growth that surpasses even the simple equation of anabolism and catabolism. There is a yearning to seek the infinite, to grow in consciousness to reach the ineffable heights of Reality. One seeks to surpass oneself, to aggrandise oneself at all levels of consciousness. Thus is born the phenomenon of Desire. The simple principle of anabolism and catabolism representing the Upanishadic description of mutual devouring was sufficient to maintain homeostasis in the physical world. But once the human consciousness was impregnated with the remembrance of its Infinite origin, there arose an all-surpassing yearning at all levels of the being which culminated in the great adventure of realizing the Infinite in the Finite. Naturally the individual in the zeal of continually exceeding one’s finite capacities to reach out for the Infinite has to surpass at some point the simple homeostasis maintained by the principle of anabolism and catabolism –the principle of mutual devouring. One needs to move to progressively higher poises of homeostasis where the principle of mutual devouring is surpassed by the principle of mutual giving. 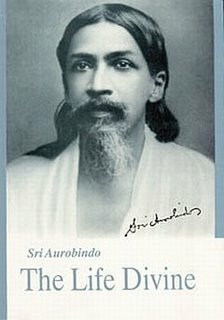 There has to be a shift to ‘an increasingly joyous sacrifice of interchange; -- the individual gives himself to other individuals and receives them back in exchange; the lower gives itself to the higher and the higher to the lower so that they may be fulfilled in each other; the human gives itself to the Divine and the Divine to the human; the All in the individual gives itself to the All in the universe and receives its realised universality as a divine recompense. Thus the Law of Hunger must give progressively to the law of Love, the law of Division to the Law of Unity, the Law of Death to the Law of Immortality. Such is the necessity, such the justification, such the culmination and self-fulfilment of the Desire that is at work in the universe (Ibid, pg.209-210). Thus what starts as the Law of Desire becomes in its movement to the Infinite, the Laws of the Supernals (Love, Unity,Immortality). There is one great impediment to the aspirational movement of Desire. That is Inertia or Tamas which is the hall-mark of the physical consciousness -- the basic template that supports the flowering of all the higher planes in its matrix. Some amount of inertia is inevitable as it is needed to maintain the durability and consistency of forms which otherwise would have been swept away in the flood of aggrandizement. Yet a more than optimal dose of inertia than is required for the maintenance of forms can be an impediment to growth and is the origin of laziness and harbinger of Ignorance in human nature. Succumbing to inertia and its consequences, laziness and Ignorance would hold up human progress at all levels of life.